October is hands down our favorite month to fish. If we could somehow stretch October to encapsulate at least 285 days a year, that’d be just peachy. It’s far too short as it is and the days, growing shorter and shorter with each breath, seem to breeze by at a break neck pace. What’s not to like about the season? It’s not too hot, not too cold, not too wet, not too dry and of course the fly fishing opportunities certainly tip the scales in our favor. October is, as Jerry Seinfeld might call it, Even Steven, with the exception of the fishing, which can be incongruently awesome. 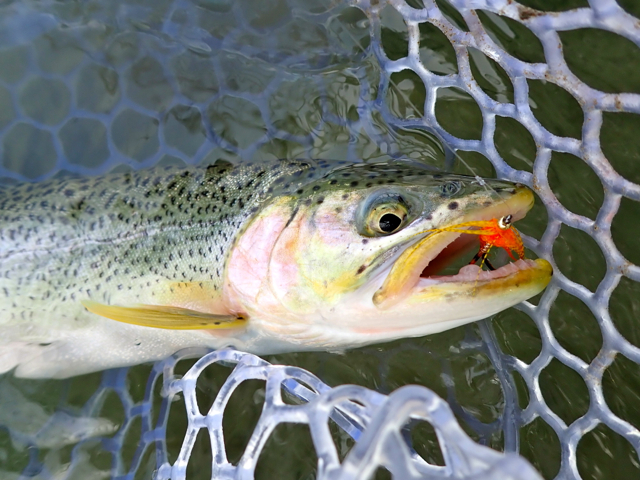 We have salmon in the rivers, cutthroat showing up and appearing to average a bit bigger than normal, hungry rainbows in lakes and rivers with a seasonable appetite to offset the onslaught of cold weather. We could certainly use another shot of moisture to stir things up a bit with our current low water conditions, but we’re not exactly complaining either. It’s pretty glorious being outside these days. Aside from a wealth of fly fishing options, we have some cool events on the horizon as well as a ton of sale stuff at the shop to go easy on your pocket books. We’re kicking off our fall and winter fly tying nights at Brandywine Kitchen on October 17th with more such nights to follow. I will be tying bonefish patterns and Brandon will cover some of the local salmon stuff. I also have a presentation on Lower Mainland BC Coho on the Fly for the Fidalgo Fly Club on October 18th if you’re interested in learning more about one of our favorite local fisheries this time of year. 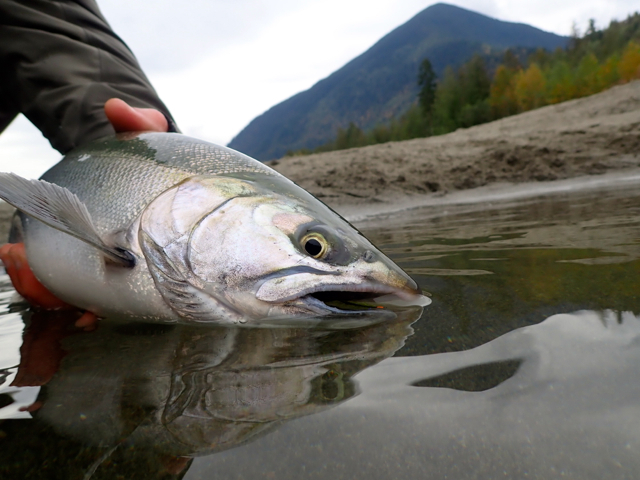 While October is inarguably the month, November and December are pretty decent themselves, with burly chum salmon, more coho (the big grabbier ones), more cutthroat and hungry bull trout beginning to reappear and hit the gravy train after a fall spawning run. Weather-wise, it’s often a crap shoot from here on out, so make sure to pick up some flies, drop by the shop for a report and scramble to spend a few more days comfortably fishing in a T-shirt. North Sound and BC rivers are currently on the low side. Pretty much all of them have coho making their way upstream and Fraser tributaries are seeing a good number of chum salmon showing up as well. The Skagit and SF Nooksack have a lot of coho around, with fish scattered throughout the Vedder as well. The Stave, Harrison and Nicomen Slough are starting to get some coho back too, though should improve as the month wears on. For the current water conditions, go early, go late, go small. 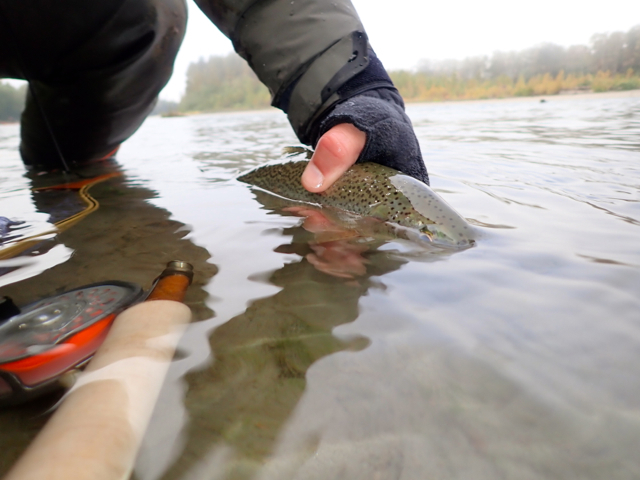 Low light affords the best opportunity to find willing coho in low water. We fish sparse Rolled Muddlers in chartreuse, blue, olive or natural, green California Neils, white, red or copper Coho Buggers. We mainly fish full intermediate lines and really like the Scientific Anglers Stillwater Camo and Rio Aqualux II. Lengthen and lighten your leaders and have at it. There are some fresh coho around in addition to the darker fish that have been in the system awhile. Rivers to the north are getting decent numbers of chum salmon now. If you don’t want to wait until November when our chum typically appear in number then grab your passport, BC freshwater license and head across the border. Pink and purple Starlight Leeches, Popsicles and Comets work well for the chum. A dead drifted presentation on a sink tip with the occasional twitch does the job, however a floating line and weighted fly suspended under an indicator is absolutely deadly on chum and will all but eliminate your incidence of foul hooking fish, which is a definite bonus for both parties involved. 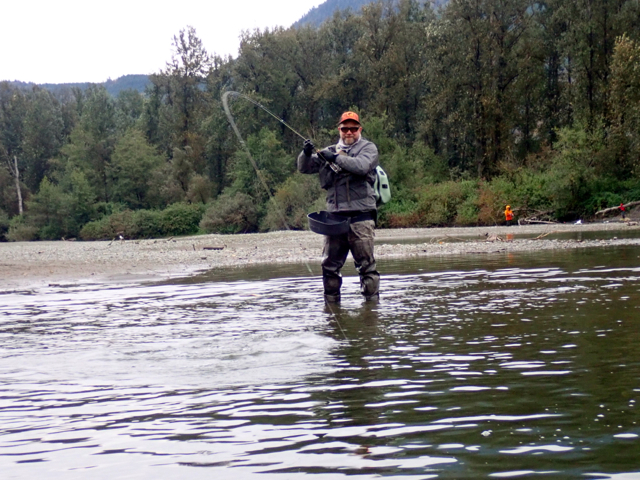 The Skagit and Stilly mainstem have continued to fish very well for sea run cutthroat. Find the slow water with woody debris and undercut banks. 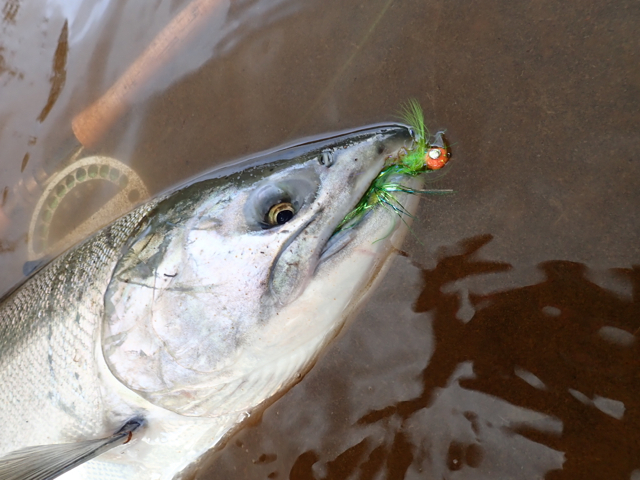 Last month’s fly of the month, the Peter Parker as well as the current fly of the month, the Gold Bead Rolled Muddler are performing outstanding. After a long, sad summer of being closed to all fishing, the NF Stilly opens October 16th for fly only. There’s bound to be more than a few summer steelhead in the system willing to take a fly, in addition to good numbers of sea run cutthroat hanging around too. Bull trout are beginning to spawn this month. Few but the most resolute of mountain goats is going to find them where they typically go to spawn, but we like to let them quietly do their thing this time of year and focus on fishing the lower portions of our river systems for bright salmon, cutthroat and those bulls that opt to take a pass on this year’s mating activities. With decent numbers of coho around in the rivers, it’s been hard to break away to probe our local lakes as fall sets in. We’ve had several strong reports from BC interior lakes in the Merritt and Kamloops area, along with good fishing at Pass and Squalicum. 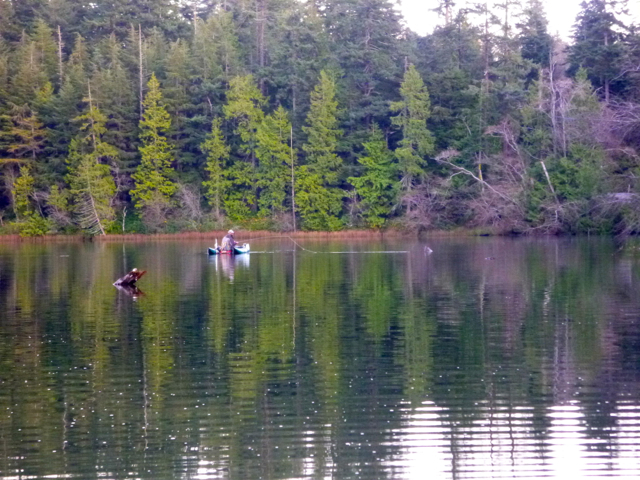 General lowland lakes like Padden and Cain will close at the end of October, so get in while you can. High lakes will also wind down soon as Mother Nature shuts the gate with a fresh blanket of snow and subfreezing temperatures until things warm up again next spring and summer. We’ve had outstanding reports from Ross Lake, which also remains open through the end of October. The road into Hozomeen remains closed through the end of the year at least, so getting a boat in can be tricky unless you access the lake from the south end and rent a boat from Ross Lake Resort. If you go, shiners are on the menu as usual so bring your Marabou Clousers, olive Clousers, Zonkers in olive or white, Micro Zonkers and Thin Mints. A full sinking line is still a must, but you’ll often find fish up on the shoals and very tight to the shoreline feeding as the days grow shorter and the water temperature drops. For any fall lake outing, you’ll find insect hatches pale in comparison to spring and early summer. Leech patterns like the Hale Bopps, Balanced Leeches, Beadhead Mini Leeches and Stillwater Buggers work well, along with a variety of minnow patterns, especially on Pass Lake. If your lake has scuds, these become a more important food source in the fall as they’re available all the time. Trout seem to know that the season is changing and will feed pretty heavily this time of year to pack on an extra layer for the winter. You’ll also often find a modicum of solitude on the stillwaters that is sometimes absent from our more popular salmon fisheries. Folks are still picking up the odd sea run cutthroat around our creek mouths and estuaries despite many fish being up in the larger rivers of the North Sound. Your baitfish imitations will still do the trick, like Mini-Ceivers and Clousers, though fall salty cutts, like their freshwater brethren are often suckers for attractors like Bucktail Coachmen and Mickey Finns, so have a few brighter flies on hand. 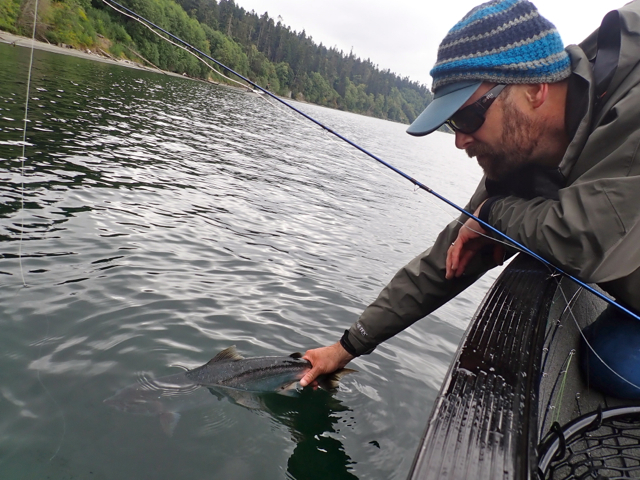 Tagged coho, cutthroat, Fishing Report, ross lake.